These Hot Wheels cars are rubber band powered! Perform up to 5 loops with no launcher or booster needed. Inspire creativity and learning while having a blast! Play with Hot Wheels in new, innovative ways that inspire creativity and learning while having a blast! 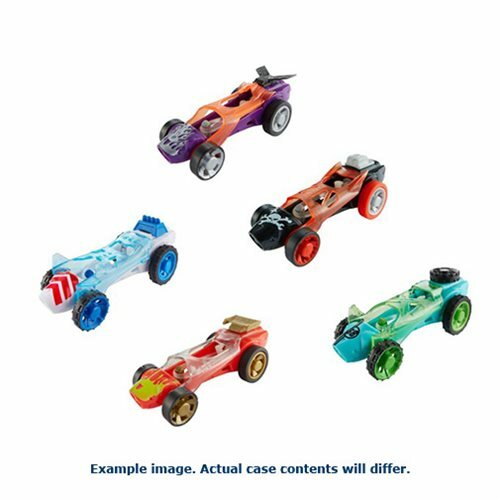 Get started with the 1:64 scale Hot Wheels Speed Winders Track Stars Cars 2016 Mix 1 assortment that uses rubber bands to supply the power. Crank up the speed as you wind the rubber bands inside the drive shaft using the back knob. Looking for performance? These cars can perform up to 5 loops with no launcher or booster needed! Experiment with the different bands included (or others) and adjust the number of times you crank to achieve different speeds and distances. Powering vehicles with rubber bands takes the thrill of Hot Wheels into the realms of science, technology, engineering, art, and math - the building blocks for problem solving and innovation. Colors and decorations may vary. Not for use with some Hot Wheels track sets. Ages 4 and up.